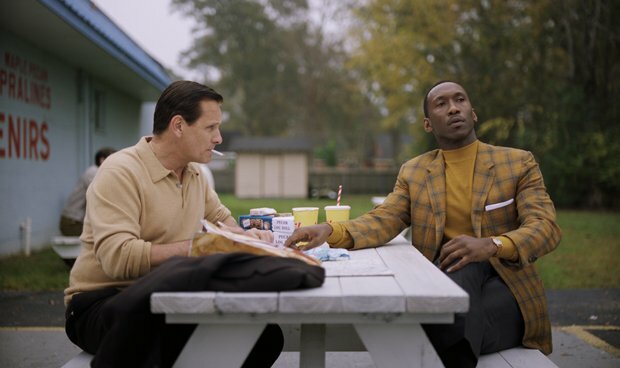 Based on the real-life friendship between African-American virtuoso pianist Don Shirley and his homespun Italian-American driver Tony 'Lip', Green Book features two outstanding, Oscar-nominated performances from Mahershala Ali and Viggo Mortensen as the unlikely pair. Despite their impressive talents, and an emotionally rousing screenplay, there is, however, no escaping the fact that this is another film about bigotry and prejudice told through the experiences of a white man. In making Tony the protagonist of this story, writers Nick Vallelonga (Tony's son), Brian Currie and writer-director Peter Farrelly – best known for his broad, comedic collaborations with brother Bobby, including Dumb and Dumber – dilute the dramatic thrust. We watch as, chauffeuring Don on a musical tour of America's Deep South in 1962, Tony slowly awakens to the personal cost of the insidious racism they encounter wherever they go. In tracking this journey, narrative beats are obvious. An early scene sees Tony throw a glass into the trash after an African-American plumber has used it. Later, he questions why Don isn't allowed to eat in the restaurant of a hotel in which he's due to perform. Through it all, Don remains poised, responding to the abuse he receives with a resigned acceptance that, while perhaps historically authentic, makes his character something of a cipher; it's Tony who gets angry, Tony who demands change. A sequence in which Don is arrested after a shower-room dalliance with another man offers a brief glimpse into his internal agonies, but is soon glossed over and forgotten. Production values are undeniably exquisite. Sean Porter's cinematography and Tim Galvin's production design capture the halcyon glow of the early 1960s, where change was on the horizon and there was a sense of optimism in the air. Similarly, Kris Bowers' score dips and swells, chiming with regret and soaring with promise. It's easy to get swept up in the good-natured worthiness of it all. And yet, good-natured worthiness is not the bullseye at which a film like this should be aiming. It is certainly a heartfelt, possibly an accurate portrayal of a wonderful, life-affirming friendship. It absolutely suggests that we are all capable of change. But, as social commentary, it's far too gentle, broad and acquiescing to be effective. And held up against other thematically similar recent works like Get Out, Sorry to Bother You and BlacKkKlansman its lack of any real bite is fully laid bare. Very well made film, which makes its points acutely but not bluntly, and for which extra 'stars' could be awarded.